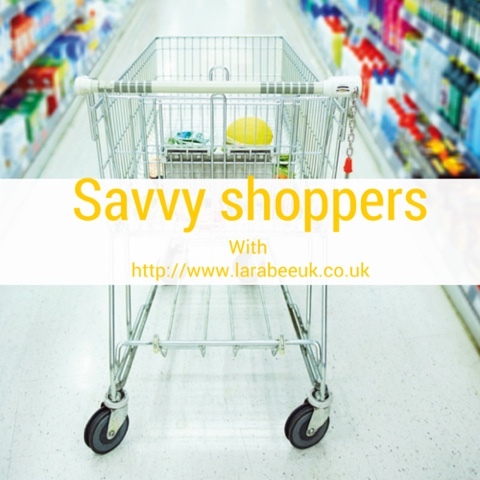 This week, my friend and super mum Emma is my 'savvy shopper' she's a single mum of 2 amazing meal planner and domestic goddess. I really am in awe of her home management skills. Emma and will also be seen soon pounding the streets of Milton Keynes with our 'old lady trolleys' when we start to visit the market for our fruit and veg. I've only recently started using Pinterest so not got a decent board going yet - I tend to get very distracted by what other people have pinned instead! The bargain/reduced counter - I cannot resist cut price meats to stock the freezer with! I use tesco vouchers and cashback apps such as Quidco, Topcashback and Shopitize to get money back, and my supermarket to find out where the best deals are. 10. What's your go to storecupboard pudding? Pancakes - I always have flour, eggs and milk in the house. Our favourite is homemade meatballs - made by my 6 year old son!!! fry the balls until browned & cooked through then add to the sauce. On a Sunday I often bake cakes/flapjacks for the kids lunches and batch cook soup, pasta or rice dishes if I am having them for lunch. I also assemble and half cook pasta bake/shepherds pie/chicken pie/lasagne if they are on the meal plan - this means I can freeze until the morning they are needed then defrost during the day and bung in the oven when we get home from school/work around 6pm each day. Thankfully not which does make things less complicated. Yes - if I make spag bol or chilli, or stews for example I will make a huge pot & freeze in portions. similarly if I do pies or bakes at the weekend I will make enough for at least 2 and freeze one fully assembled. This saves time in the week and means that there are proper hearty and healthy dishes in the freezer for that last week of the month when funds are getting low!